If you are missing the flavours of the Camino de Santiago, our friends from foodfiesta.ie share some tasty traditional recipes from various regions along the Camino so you can try them at home. 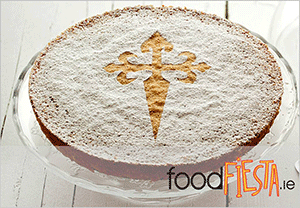 What better way to start your Camino recipe collection with than Santiago’s classic almond tart, Tarta de Santiago? Finely grind raw almonds (or grab your shop-bought ground almonds) and place in a bowl with the caster sugar, lemon zest and cinnamon. Stir with a fork till well blended. Add eggs one by one and splash of brandy (optional), mixing to blend evenly with a wooden spoon or rubber spatula. Grease a 22cm tart/quiche tin (preferably a silicone one or one with a removable bottom, for easy removal after baking). Pour the mixture evenly into the tin and bake at 170o for 50 minutes, until toasted golden. Let cool and then sprinkle with icing sugar –using a homemade Santiago cross stencil for the authentic look! Serve plain or with ‘café con leche’… or doused in sweet dessert wine. *To achieve a lighter, fluffier version of Santiago Almond Tart (also yummy, though less traditional than the denser torte): beat the eggs and sugar first with an electric beater until they double in size and then add the ground almonds, lemon zest, cinnamon and brandy and blend. Then bake as above. Ingredients: 50ml whole milk, 50ml sunflower oil, 130g plain wheat flour, 25g sugar, pinch salt. Directions: Mix oil with milk, flour, sugar and salt. Knead to form a soft, smooth dough. Cover dough and let rest for half an hour. Sprinkle flour on two large pieces of baking paper and sandwich dough between them. Roll out until about 3mm in thickness. Carefully lift and place dough in tart/quiche tin. Trim edges. Pour in almond filling. Bake as above. Let us know if there is any particular Camino food you are missing and we’ll find the recipe for you.